KANSAS CITY, Mo. — School officials at Blue Valley School District in Kansas say they are having a problem with students vaping at school. The problem is so severe that school officials are calling it an "epidemic." "Students have been caught vaping in classes, in our hallways, in our bathrooms," said David Stubblefield, Blue Valley's executive director of school administration. 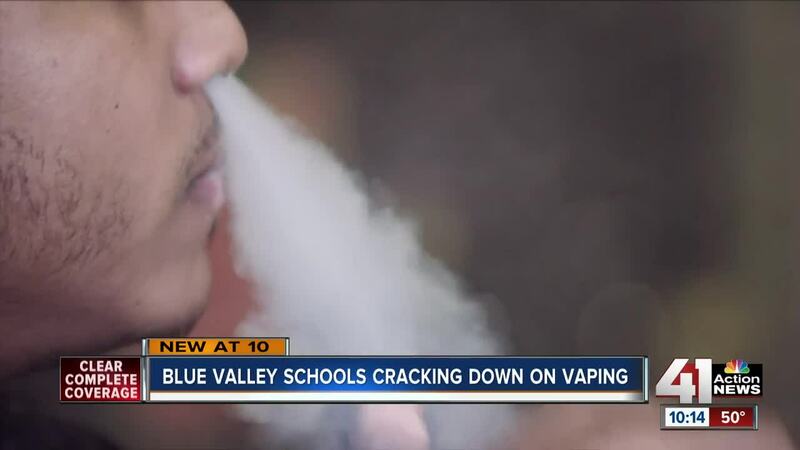 "Kids have come to us and said they cannot sit through an entire class without vaping." According to the school district, vaping usage has increased among students in high school year after year. The district has also seen students vaping in middle school. Every day, principals are dealing with some problem involving vaping, Stubblefield said. "A lot of times there’s not a long-lasting smell to it and the vape can dissipate very quickly. They are so easily concealable because they look like normal, everyday devices, like a USB," Stubblefield said. To combat vaping, the school district is focusing on education. Tuesday night, the district hosted an open house for parents and students to learn about potential health risks associated with vaping. The district also changed its guidelines on vaping to match its drug and alcohol policy. Accordingly, students caught vaping on school property or with vaping paraphernalia will get an automatic five-day, out-of-school suspension. However, if students watch videos and complete modules about the health dangers of vaping, the suspension is dropped to three days. Blue Valley partnered with MD Anderson Cancer Center to gain access to the modules. Stubblefield said that since the change, students have elected to watch the videos in order for their suspensions to be reduced. "We’re not going to be able to catch every student that vapes because again, it is so easily concealable," he said. "But when we start having these conversations and kids start holding each other accountable, and parents start holding each other and their kids accountable, then I think that’s how we are able to make progress on this issue."